mmsonline.com November 2017 MMS 183 MODERN EQUIPMENT REVIEW The machine can fit th ro u g h a s t a n d a rd doorway and can be installed in a few hours, the company says. Ideal for rapid pro- totyping and short-run m a n u f a c t u r i n g, t h e Neo can mill a variety of materials ranging to 20 " × 16 . 5" × 9 " i n size with its 40,000- r p m s p i n d l e a n d 24-station automatic tool changer. Datron Dynamics Inc., call 603-672-8890 or visit datron.com. TWIN-SPINDLE, TWIN-TURRET TURNING CENTER PROVIDES RIGIDITY The bed structure of Takisawa Technology's FX-800 twin-spindle, twin-turret turning center combines high rigidity and tightly controlled thermal char- acteristics. The rigid linear guideway on the Z axis and the box guideways on the X and Y axes pro- vide shock-absorbing capacity during turning. Both the upper and lower turrets have 16 sta- tions and are designed to widen the space between tools to minimize tool interference. A bigger cou- pling on the turret enhances rigidit y. Built-in spindle motors increase power performance on each servo axis. Upgraded milling drive motors enable more tool options and milling capacity. The outcome is a fast, accurate machine for pro- duction of complex components, the company says. 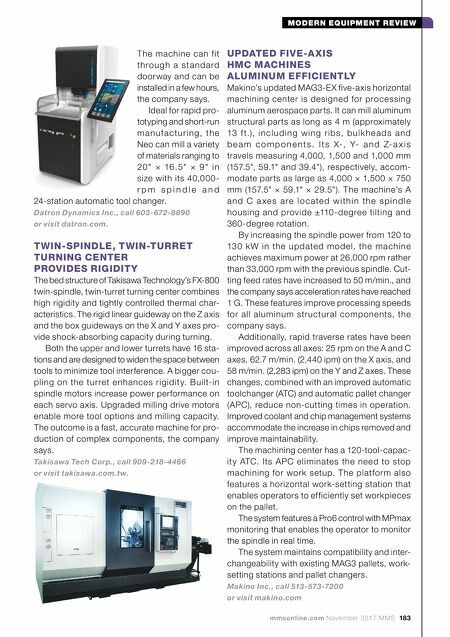 Takisawa Tech Corp., call 909-218-4466 UPDATED FIVE-A XIS HMC MACHINES ALUMINUM EFFICIENTLY Makino's updated MAG3-EX five-axis horizontal machining center is designed for processing aluminum aerospace parts. It can mill aluminum structural parts as long as 4 m (approximately 13 f t.), i n c l u d i n g w i n g r i b s, b u l k h e a d s a n d b e a m c o m p o n e n t s . I t s X-, Y- a n d Z- a x i s travels measuring 4,000, 1,500 and 1,000 mm (157.5", 59.1" and 39.4"), respectively, accom- modate parts as large as 4,000 × 1,500 × 750 mm (157.5" × 59.1" × 29.5"). The machine's A a n d C a xe s a r e l o c a te d w i t h i n t h e s p i n d l e housing and provide ±110 -degree tilting and 360-degree rotation. By increasing the spindle power from 120 to 13 0 k W in th e upd ate d mod e l, the m ac hin e achieves maximum power at 26,000 rpm rather than 33,000 rpm with the previous spindle. Cut- ting feed rates have increased to 50 m/min., and the company says acceleration rates have reached 1 G. These features improve processing speeds for all aluminum structural components, the company says. Additionally, rapid traverse rates have been improved across all axes: 25 rpm on the A and C axes, 62.7 m/min. (2,440 ipm) on the X axis, and 58 m/min. (2,283 ipm) on the Y and Z axes. These changes, combined with an improved automatic toolchanger (ATC) and automatic pallet changer (APC), reduce non-cutting times in operation. 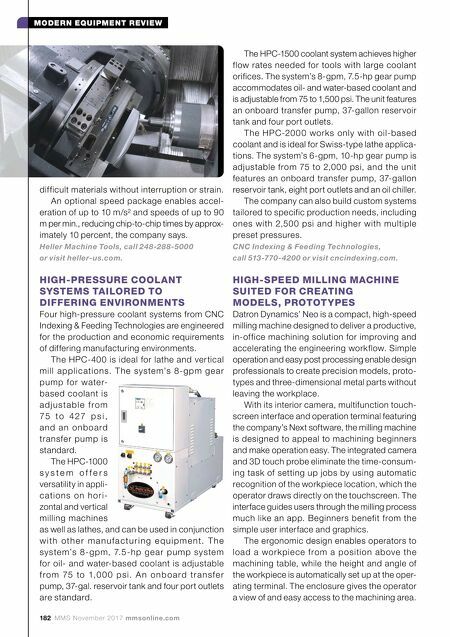 Improved coolant and chip management systems accommodate the increase in chips removed and improve maintainability. The machining center has a 120-tool-capac- it y ATC. Its APC eliminates the need to stop machining for work setup. The plat form also features a horizontal work-setting station that enables operators to efficiently set workpieces on the pallet. The system features a Pro6 control with MPmax monitoring that enables the operator to monitor the spindle in real time. The system maintains compatibility and inter- changeability with existing MAG3 pallets, work- setting stations and pallet changers. Makino Inc., call 513-573-7200 or visit makino.com or visit takisawa.com.tw.